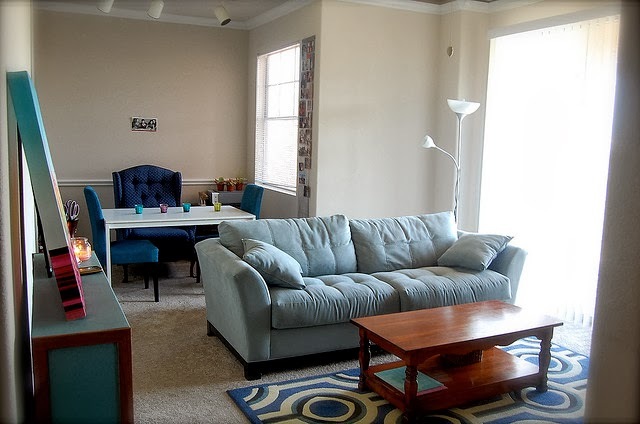 Above, you can really see the array of blue throughout her small space. A comfy sky blue sofa pairs up with a graphic cobalt rug sporting cobalt hues. A teal bookshelf occupies the nearby wall – with matching artwork on top. To the back of the room, navy and sapphire colored chairs surround a crisp white dining table. Here's a better look at the charming turquoise bookcase in Heidi's living room. 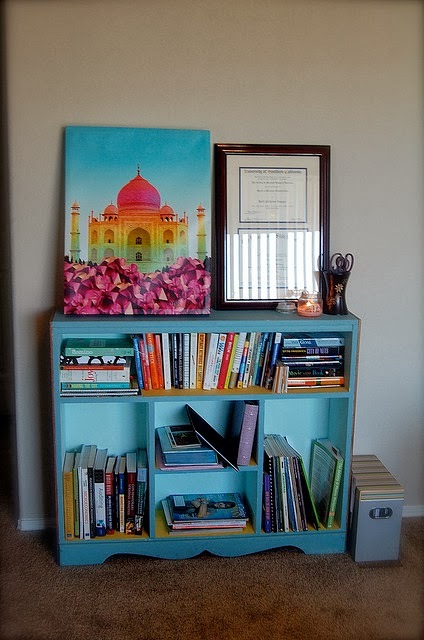 Books, magazines, and a candle all call the shelf home while a lovely painting of the Taj Mahal picks up on the teal and adds splashes of yellow and pink. I love the mixing and matching of chairs here with the sleek white dining table. Rather than just having two blue dining chairs sitting far from each other at a large dining table, Heidi brought in a large wing-back arm chair for a third seating option. Candles in cool turquoise, purple, and green toned glass votive cups make the tabletop inviting without cluttering it up. 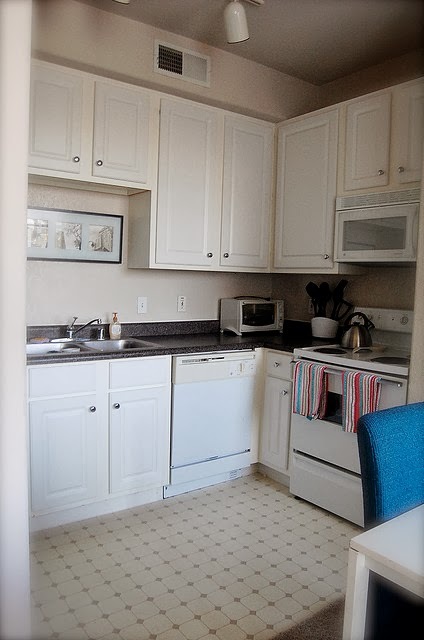 Heidi kept the kitchen crisp, clean, and clutter-free with its neutral shades of white, charcoal, and beige. Colorful striped towels pop amid all the neutrals. 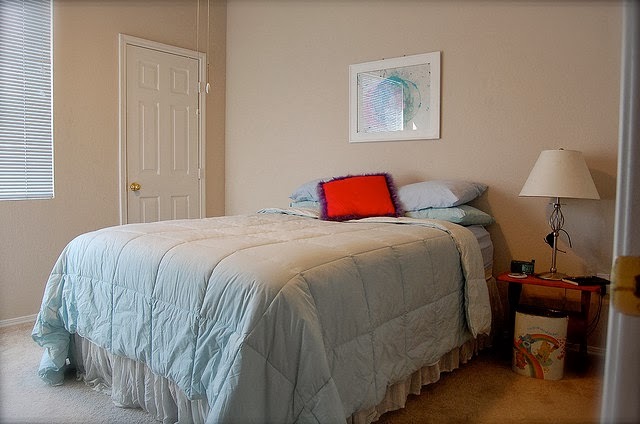 Pale blue and soft beige give the bedroom a light, airy, and almost beachy feel. It's a tranquil space – with a pop of color thanks to the red pillow. A gorgeous(!) 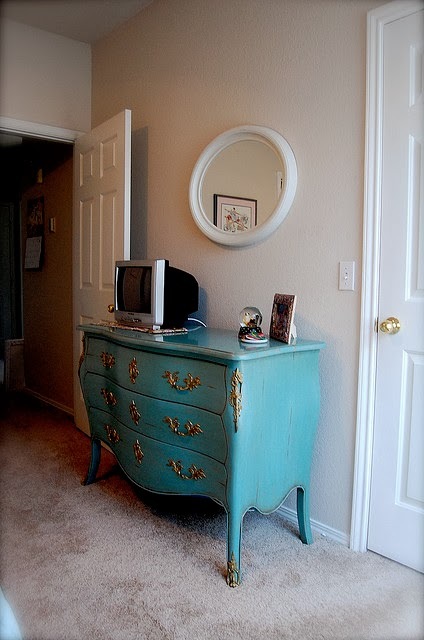 vintage dresser painted bold turquoise and accented with gold takes on double duty as both storage and a tv stand. Minimal accessories keep the dresser top clutter-free so that the color can take center stage. Heidi's apartment is a prime example of how to incorporate color in your neutral space – especially if you don't want to overwhelm the space with too many colors. Pick a color family (she chose blue) and stick to it. The space will feel cohesive and colorful without clashing or looking cluttered. 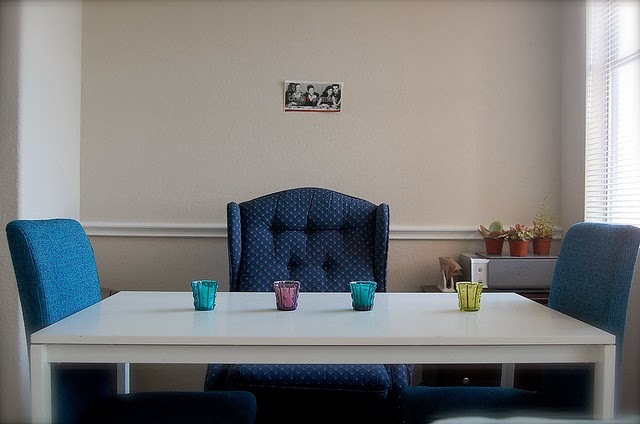 For more photos of Heidi's neutral and blue hideaway, check out her photostream on Flickr. What apartment complex is this?